The Terrapins suffered a heartbreaking loss Friday, as their two best pitchers combined to give up five runs in the eighth. They’ll head to Davenport Field Saturday to try and extend their season. They’ll have to win two consecutive games against their former ACC rival in order to reach the College World Series. John Vittas, Matt Present and Jon Lewis will be live from Charlottesville Saturday, with the Pre-Game Show getting underway at 2:50pm. The Terps are 1-0 this year when facing elimination. They defeated UCLA in a winner-take-all scenario on Monday. That also came on the opponent’s home field. Last year, Virginia lost the first Super Regional game at home, and came back to win the series. The Terrapins hope to reverse that scenario this year. Selmer is making his fourth start of 2015 and his second of the postseason. He took the loss in Maryland’s 4-2 defeat at UCLA last Sunday, the first loss of his career. The 6-foot-8 righty did not make it out of the third inning, surrendering eight hits. The UCLA loss was a rare blip on Selmer’s resume, as the Riverdale Baptist product had only allowed 8 earned runs in his previous 29 outings. He’ll tie Maryland’s single-season appearance record today, a mark set by Bobby Ruse last year. Waddell did not allow an earned run over 7.1 innings to defeat San Diego State in Game 2 of the Lake Elsinore Regional last weekend. The lefty from Texas has had a trying season, however. He’s registered just three wins in 15 starts and has allowed the opponents to bat .281 against him. Waddell had his way with Maryland last year, defeating Mike Shawaryn and the Terps in Game 2 of the 2014 Super Regionals. He allowed just one run over five and two thirds. Davenport Field will be rocking again on Saturday. Waddell is the seventh lefty the Terps will see in this year’s postseason. They’ve gone 4-2 against southpaws over that span. Maryland knocked around Ole Miss’ Christian Trent and UCLA’s Grant Watson last weekend for a combined 17 hits over 13 innings. Trent, Watson and Waddell have all had excellent postseason success and possess Omaha experience. Friday was just the second time all year Maryland has blown a lead after leading through seven innings. Ironically, the other time it happened, Maryland also allowed five runs in the eighth. That came at UNC Wilmington in the second game of a doubleheader on March 7. Before yesterday, Maryland had been 23-2 when scoring first this season. Yesterday’s game was just the fourth time the Terps lost a Mike Shawaryn start in 2015. They had been 13-3. After the three regular season losses in Shawaryn starts, Maryland failed to bounce back each time. They lost Game 2 to UNC Wilmington, Indiana and Northwestern. Kevin Martir has now reached base in 7 of his last 10 plate appearances. He is 5 for his last 7 and is now Maryland’s leading hitter. John Vittas and Matt Present will be live from a sold-out Davenport Field in Charlottesville, VA for the rematch between former ACC rivals Virginia and Maryland. 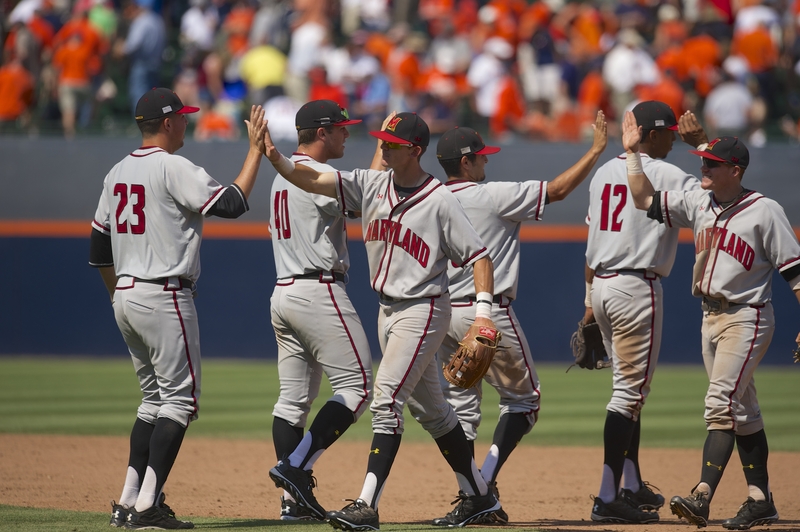 The Terps and Wahoos met four times in 2014, with each team taking two games. Maryland won the round-robin contest in the ACC Tournament, while Virginia took two of three in the NCAA Super Regionals. 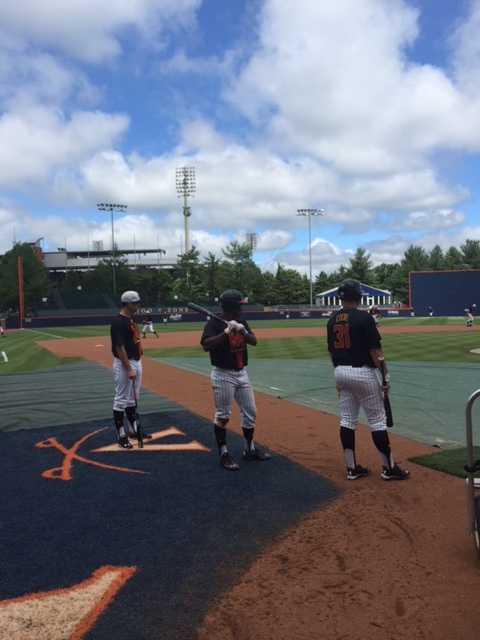 Maryland beat UVA on their home field in Game 1 of the Super Regionals last year. Maryland took the Super Regional opener last year, with Jake Stinnett defeating Cavalier ace Nathan Kirby. The Terrapins roughed up Kirby for five runs in 4.2 innings. Charlie White and Jose Cuas had multi-hit games and Brandon Lowe drove in two in the 5-4 Maryland win. This year, Kirby is attempting to return from a lat injury and is rumored to be available in relief or to potentially start on Sunday. If not, Virginia will have to decide whether to use Josh Sborz in his typical closer’s role, or start him in a potential Game 3 – which is what UVA did last year when they beat Maryland in the final game. Maryland has lost a key starter as well. Freshman Brian Shaffer has been shut down after experiencing arm pain during Maryland’s 4-1 win over UCLA last Saturday. With Ryan Selmer and Taylor Bloom the other two Maryland starters, it is unclear who will start Game 2 and who will start Game 3. Reserve outfielder Zach Jancarski has returned to the team and Kengo Kawahara is healthier than he was last weekend, meaning Maryland’s bench is in better shape than it was in UCLA, when they were operating with two and a half healthy bench players. Shawaryn is going for personal redemption Friday. He’s started his career 24-6, with one of those six losses coming against Virginia last year in Game 2 of the Super Regionals. He’ll return to Davenport Field for the first time since that loss, an outing in which he allowed five runs on 12 hits. The righty is coming off a gutsy outing against Ole Miss in the Regionals. He allowed one run over five and one third, walking a season-high five while striking out nine. He’ll extend his school record for single-season strikeouts today, setting a mark that might never be broken. Jones is a hard-throwing righty from Chesapeake, Virginia who has had an excellent sophomore season. He was a reliever last year for UVA, but has emerged as the ace this year after Kirby’s injury. The former Virginia Gatorade Player of the Year, Jones was a High School All-American who was drafted by the San Diego Padres before attending Virginia. Brandon Waddell: 7.1 IP, 4 H, 0 ER, vs. San Diego St. The top-seeded Bruins defeated Maryland 4-2 last night, forcing a decisive seventh game in the LA Regional. Both teams won the last Regional title game they played in. The Terps beat South Carolina on this date last year, and UCLA won the 2013 Regional final over San Diego, en route to a National Championship. Bloom makes his fifth start of 2015, and will be on the mound for the first time since taking the loss in the Big Ten Championship game. He shut down Michigan for the first three innings before falling victim to his own throwing error in the fourth. 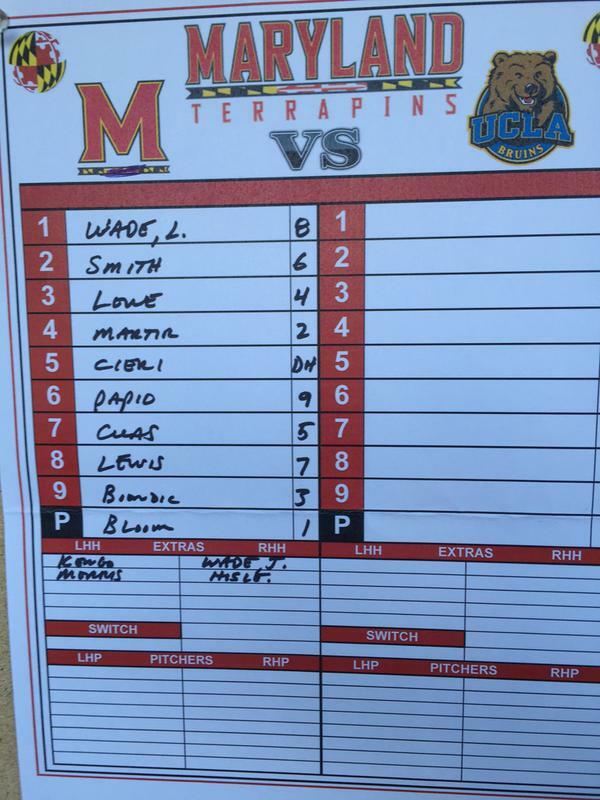 The freshman from Crofton will need to make good use of his changeup tonight against UCLA’s left-handed heavy order. Maryland is only trying to get Bloom one trip through the Bruins’ order, before lining up their deep bullpen against the UCLA bats. UCLA has used all four of their starting pitchers in the Regional, and their fifth starter has been injured for a month, so they will have to use their bullpen for all nine innings Monday. They’ll start set-up man Grant Dyer, who has the best opponents batting average on the best pitching staff in the nation. The opposition is batting just .174 against Dyer, and has scored only 11 earned runs in 55 innings (1.80 ERA). Dyer has made two relief appearances in the Regional, tossing 1.2 scoreless innings against Cal State Bakersfield. He will be the first right-handed starter Maryland has seen since Illinois’ Drasen Johnson faced the Terrapins in the second game of the Big Ten Tournament. Dyer will end a string of five straight games that the Terps have seen a lefty starter. Tonight’s game features two of the best closers in college baseball, David Berg and Kevin Mooney. They’ll both be available for multiple innings, and so whoever has the lead after six will likely win the game. 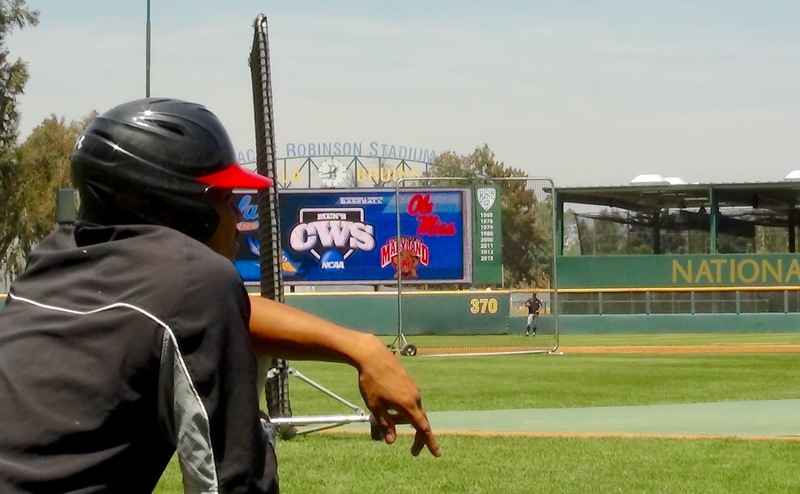 MBN’s John Vittas will be live from Jackie Robinson Stadium in Los Angeles to call Maryland’s winner’s bracket game with the NCAA Tournament’s No. 1 overall seed, UCLA. CLICK HERE TO LISTEN LIVE AT 10:30 and follow @mdbaseballnet for live updates. Today’s pre-game show will feature full highlights from yesterday’s 3-1 win over Ole Miss and interviews from several Terps. LHP Willie Rios will join the show live. UCLA is the tournament favorite, having gone 43-14 in the regular season. They are the Pac 12 champions. They defeated Cal State Bakersfield last night, 7-2. Their winning ways are predicated on pitching, small ball and doing the little things. The Bruins lead the nation in pitching, having posted a 2.16 ERA on the year. Their K/BB ratio and H/9 rate also rank top four in college baseball. Their bullpen is lights out. The trio of David Berg, Tucker Forbes and Grant Dyer have held opponents to a 1.59 ERA over 129 innings of work. The good news for Maryland is that they used their ace James Kaprelian against Cal State Bakerstfield. Shaffer is coming off the best outing of young Terps career. He allowed only one run while striking out seven over seven innings to beat No. 4 Illinois in the Big Ten Tournament, likely securing Maryland’s spot in the NCAA Tournament. The freshman has pitched much better in the second half of the season. He’s gone at least five innings in his last four starts and has struck out 21 batters over that span. Watson has been a four-year staple on the UCLA , having amassed 30 wins over 369.2 career innings. In 2015, Watson has gone six innings or more in 12 of his 15 starts. He mixes four pitches and locates well, having pitched to a 2.08 ERA this year. He’s been even better at home, having allowed a total of seven earned runs in nine home starts this season. Watson pitched two relief outings against the Terps in 2012 and did not allow a run. UCLA head coach John Savage has built a dynasty in his 12 years in Westwood, CA. The Bruins have hosted a Regional in five of their last six years, and have reached three College World Series’ over that span. They won the 2013 National Championship, but did not qualify for the NCAA Tournament last year. The Terps will play in their second consecutive NCAA Tournament when they take on the Ole Miss Rebels Friday at 7pm. ET in Los Angeles, California. It’s only the second time in school history that they’ve qualified for the NCAA Tournament in back-to-back seasons, and the first since 1970-71. The Terps swept top-seeded South Carolina as a 2-seed last year and will look to take down the Tournament’s No. 1 overall seed this season. Ole Miss was a College World Series team in 2014 and finished as the third place team in Omaha. Shawaryn pitched another gem in the Big Ten Tournament, taking down Michigan State in the opening game. The freshly-minted First Team All-American has been excellent in four career postseason starts. Against some of the best competition, he’s gone 3-1 with a 3.08 ERA. Excluding the lone loss against Virginia, he’s allowed just four runs in three starts, amounting to a 1.77 ERA. Trent has an impressive postseason track record in his own right. Ole Miss won in all three of his starts in the 2014 postseason. He dominated the No. 1 overall seed UL Lafayette in the Super Regionals, allowing just one unearned run over seven innings. He followed it up with eight shutout innings against Texas Tech in College World Series. Trent has pitched eight innings in three of his last four starts and has gotten through five innings in every start this season. LaMonte Wade looks to add another All-Region performance to his resume. Ole Miss has now made the tournament in 13 of head coach Mike Bianco’s 15 seasons. He’s led the Rebels to five Super Regionals and produced 84 pro draft picks. Over the past decade, Bianco has churned out 26 All Americans as he’s built a college baseball powerhouse in Oxford. Ole Miss has one of the most devout fan bases in college baseball, as they’ve finished top five in the country in attendance for the last nine years. They’ve produced a host of Big Leaguers over the years, as Rebels baseball dates all the way back to 1893. Current Ole Miss Major Leaguers include Lance Lynn, Zack Cozart, Aaron Barrett, Seth Smith, Drew Pomeranz and Chris Coghlan. 2015 has been a down season for Bianco’s club, despite the fact that they finished above .500 in the SEC and earned a two-seed in the NCAA Tournament. They’re led by the power hitting Sikes Orvis, who has slugged 16 home runs already this year. Colby Bortles and JB Woodman also provide pop in the middle of the Rebels lineup, while shortstop Errol Robinson serves as a table setter and slick defender. Robinson graduated from St. John’s College High School in Maryland and grew up playing with many of the current Terps. The Rebels will be playing on nine days of rest Friday. They lost their single-elimination game against Alabama in the SEC Tournament last Tuesday. Don’t be surprised if all the games this weekend are low-scoring. UCLA has arguably the best pitching staff in the country, and both Trent and Shawaryn have been stingy in the postseason. My take: It’ll come down to defense. Whoever makes the least mistakes will win. Coming off Maryland’s first ever Big Ten Tournament victory, the Terps had less than 24 hours to prepare for their toughest test of the season—Illinois. The Fighting Illini lead the conference in both batting average and earned run average, a deadly combination, and perhaps most impressively, they come into the game with a 27-game winning streak. Illinois last fell on March 29th at the hands of Michigan State. In his post-game press conference last night, John Szefc stressed that the key to these tournaments are starting pitching and defense. However, outside of Mike Shawaryn, the Terps have yet to find a reliable strike thrower to begin a ballgame. The Terps have tried ten different arms in the starting rotation, but Shawaryn is the only one who has remained a constant, and the only one with double-digit starts. The sophomore right-hander did his job last night, allowing just one run in seven innings, striking out nine, and picking up his twelfth win of the season. But in order to propel themselves through postseason play, the Terps need at least one more starter to come into his own. John Szefc continues to search for consistency in the starting rotation. Last night Szefc said that Brian Shaffer would be the probable starter tonight, but that it was not a definite. Shaffer would be the logical choice. After Shawaryn, he has made more starts than any other pitcher, with nine. However, in his last two weeks in the weekend rotation, he’s been decent, at best. Two weeks ago at Ohio State, he gave up five runs, four earned, in five innings. Last week at Northwestern he gave up three earned in five and a third, but did strike out six. These aren’t terrible numbers by any means, but at the same time, the Terps will need him to be better, facing the top team in the conference. On the season the 6-5 freshman is 4-1, with a 5.19 ERA. With the victory last night, the Terps guaranteed themselves a third game Friday, in this double elimination format. Assuming Shaffer gets the nod today, the Terps may have more questions than answers as to who their third starter will be. If you continue down the list of starts this season, Drossner would follow Shaffer. While Drossner’s ERA isn’t bad, at 4.50, he has struggled with his command throughout the season, issuing a team high 26 walks, in 32 innings of work. (As a point of reference, Shawaryn has allowed 23 free passes in 103.1 innings pitched). Ryan Selmer started the final game of the regular season, and got the victory over Northwestern, allowing just one earned run through six innings pitched. But that was his only start of the season. The 6-8 redshirt freshman has been dominant out of the bullpen throughout the season posting a 3-0 record and 1.60 ERA on the year. So for Szefc and pitching coach Jim Belanger, the decision will likely come down to throwing a guy with one career start into the fire, or hoping that Drossner can find his stuff from last year’s ACC tournament, in which he earned the start in the tournament final against Georgia Tech. But the task at hand is Illinois, and redshirt senior Drasen Johnson, who is 9-2 on the year with a 2.34 ERA. The Illini also boast a lineup with six players hitting over .300, led by David Kerian who leads the Big Ten in average (.383), home runs (13), on base percentage (.459), and slugging percentage (.647). Between the dominance on the hill and the batters box, it’s easy to see why Illinois is ranked as high as second in the nation by Collegiate Baseball. First pitch tonight is at 10 p.m. EST, and Jake Eisenberg will be on the call from Target Field. You can listen to his call right here, and follow @mdbaseballnet on Twitter. Be sure to check back with us after the game for a full recap and a preview of the Terps Friday opponent. The Terrapins open up their first Big Ten Tournament as the No.-4 seed, and will face off with #5 Michigan St. tonight at 9:00 p.m. CT (10 p.m. EST). 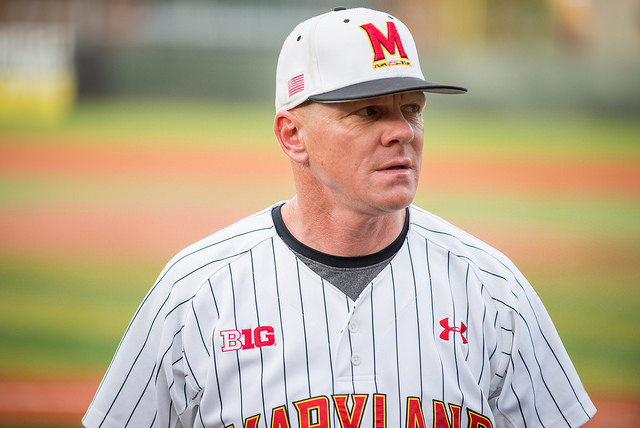 The Terrapins find themselves on the NCAA bubble following a series loss to Northwestern in the last weekend of the regular season, and will need to go deep into the Big Ten Tournament to guarantee themselves a spot in an NCAA Regional. First, the Terps will face the Michigan State Spartans for the first time in program history. The Spartans have been in Minneapolis, Minn., for almost a week now, as they finished their season with a series against the Minnesota Golden Gophers. The Gophers, who did not make the Big Ten Tournament after finishing 21-30 (9-15), lost the first game against the Spartans, but took the last two to win the series, much like the Terps dropped two of three to Northwestern. The Spartans offense has been one of the best in the Big Ten. They ranked in the top-3 in batting average (.291), hits (537) and home runs (43). Their prowess is thanks to two bats in the lineup: seniors Ryan Krill and Mark Weist. Krill, the first baseman, and Weist, the third baseman, have hit 2nd and 3rd, respectively, in the lineup throughout the season. They were both recently named to All-Big Ten team—Weist to the First-Team and Krill to the Second-Team. In the regular season, Weist led the team in hits with 73 and hit .335 after starting in all 54 of the Spartans’ games. He also led the team in doubles with 17. He’s hit safely in 44 of the 54 games, half of those being multi-hit affairs. Krill followed suit, recording 70 hits on the season, good for second on the team. 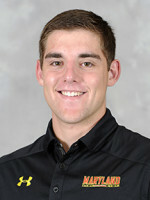 His .363 average leads the team, and is good for third in the country. His 12 home runs are second-most in the country as well. The first baseman also led the conference in almost every major offensive category during conference play: batting average (.451), slugging percentage (.857), on-base percentage (.545), RBIs (36) and home runs (10). However, the Terps offense shouldn’t be overlooked. While it’s been streaky—39 runs on 50 hits in three games against Ohio State, and then just seven runs on 13 hits the following weekend against Northwestern—the Terps still lead the league in runs (365) and are tied for first with Illinois in home runs (50). And, while the Terps strike out the second-most in the league (391), they get on base at a .375 clip—thanks to a league-leading 252 walks. Shawaryn will once again bid for a single-season record 12th win. Last Thursday against Northwestern, the sophomore was the tough-luck loser, throwing 6.2 innings, striking out seven and yielding just the decisive run in a 1-0 loss. Shawaryn’s 115 strikeouts on the season are good for 6th in the country. Vieaux faced Minnesota in his most recent start, giving up 4 runs in 4.2 innings in a 5-4 win. The southpaw has been hit hard this season, giving up 100 hits, and opponents are batting .300 against him. However, despite the less-than-stellar numbers, Vieaux has been a workhorse, pitching the most innings on the team (84.0) throughout his 14 starts.